Multiple media outlets have reported that Matt LeFleur has been hired by Notre Dame as the new quarterbacks coach. LeFleur, who was most recently the quarterbacks coach for the Washington Redskins, worked as an offensive assistant under Brian Kelly at Central Michigan before headed to the NFL in 2008. Lafleur worked as an offensive quality control coach for the Houston Texans from 2008-2009 before taking the quarterback coaching job for the Washington Redskins in 2010. Lafleur is mostly known for his work with Robert Griffin III in the 2012 NFL season. 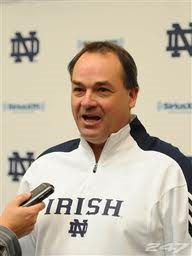 This is a great hire for the Irish. LeFleur having worked with RG3 should have Irish fans very excited for the future of Everett Golson, as well as the younger quarterback’s on the roster. Before his knee injury last year, Robert Griffin was one of the most dynamic quarterback’s in the NFL and Its safe to say I am very excited about LeFleur working with Golson. This hire by Brian Kelly, along with the promotion of Mike Denbrock to offensive coordinator, shows that the Irish are looking to speed up their tempo on offense next season, something all Irish fans have been waiting for. With Brian Kelly calling the plays, Mike Denbrock as offensive coordinator, and Everett Golson back and receiving mentoring from Matt LeFleur, we may finally get to see the Irish offense look similar to the offenses that Brian Kelly had at Cincinnati. Irish fans have been waiting patiently for the offense to become explosive and dynamic and I really believe that we will finally see that when the Irish take on Rice to start the 2014 season.